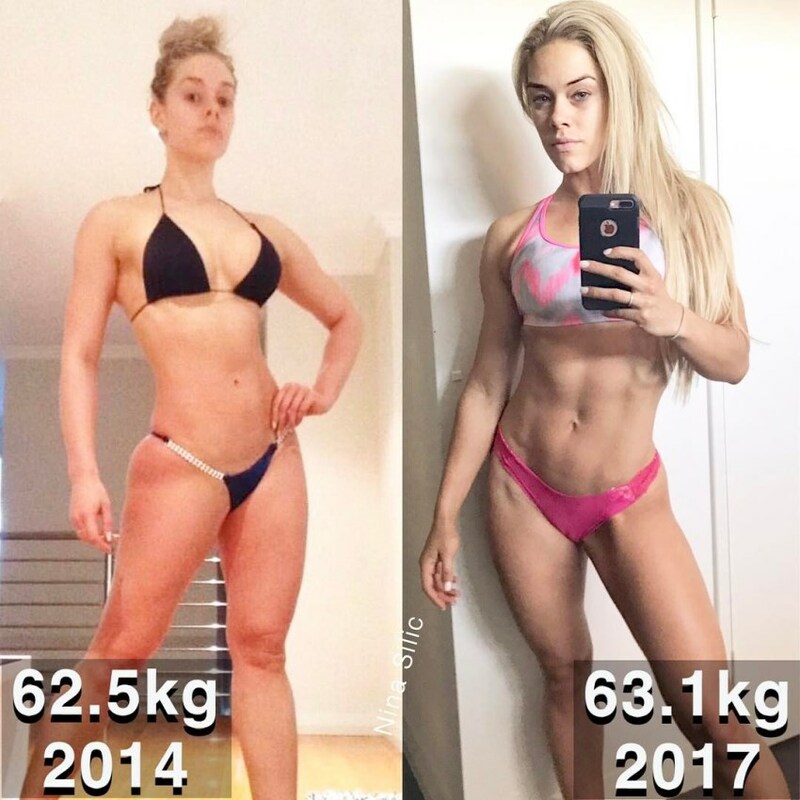 Nina Silic is an Australian fitness model and bikini competitor, known for her transformation story. An active and healthy child, Nina started struggling with weight fluctuations after she entered her 20s. During that period, she went from one extreme to another – from being overweight, to being malnourished. This resulted in her suffering mentally, developing serious self-confidence issues in the process. After bouts of depression, and many ups and downs, Nina was able to overcome all of these adversities. She began paying special attention to her diet and training; trying to be flexible and “mindful” about her food choices. Since then, she’s grown into a leading Australian fitness icon and a role model for everyone; using her adversities from the past as a way to grow stronger, and become successful in life. Nina Silic led an active and healthy lifestyle since the age of 3, when she began practicing dance. She enthusiastically took part in dance classes throughout her early schooling years and teens; hoping she would build a career out of it one day. However, after she entered her early 20’s, Nina started to have problems with weight fluctuation. She would quickly gain a lot of fat, only to lose it a couple of months later, and look dangerously underweight. This not only caused her to lose interest in dance, but in other parts of life too; damaging her self-confidence in the process. This vicious cycle lasted for years, and Nina didn’t know what to do about it. She later decided to sign up for professional dance classes at the art academy in Sydney, in an attempt to regain her self-confidence. Desperate to find a way out of her “self-induced rut”, Nina confessed her problems to a close friend. The friend then advised Nina to seek comfort in lifting weights in the gym, and use “the iron” as an outlet for all of her negative emotions and insecurities. Over the following several months, Nina started noticing major changes in her appearance. The gym soon became much more than just an “escape” for her – it developed into something she could no longer live without. One event led to the another, and Nina decided she would try to pursue a career in fitness instead of dance, by competing in bikini shows. In the January 2011, she began preparing for her first contest. After two months of strict dieting and training, she took part at the show; exceeding even her biggest expectations by winning the 1st place. From that moment on, Nina became “hooked” on the fitness lifestyle, and began competing regularly. By March 2013, she won four shows, including the 2013 FITX Pro Qualifier, which saw her earn her Pro Card. However, Nina’s road towards winning the Pro Card wasn’t very smooth. During those two years she competed, she had done some major harm to her body due to extreme dieting and over training in the gym. Her daily diet consisted of less than 1200 calories. On top of that, she did hours of cardio and weight training; chasing a “perfect image” that was impossible to achieve. As a result, she was diagnosed with hypothalamic dysfunction, adrenal fatigue, and chronic tendonitis after winning her Pro Card. After hitting “rock bottom” in terms of mental and physical health once again, Nina decided it was time to finally take control of her life – once and for all. It wasn’t easy for her at first; it took her many years to adapt to a diet which allowed her to look, and feel healthy. But, with time, she successfully transformed herself from the inside out; becoming a person she had always dreamed about. Nina is now a successful fitness athlete, who’s story has inspired countless women around the world, who struggle with similar issues. Whichever type of cardio she chooses, Nina makes sure to realize one criterion – “sweat it out”. Nina sticks to a high-protein diet throughout the whole year. Also, she eats a balanced ratio of slow-acting carbs and healthy fats, to help her with energy levels and mood. Specifically, she eats only unprocessed and healthy foods, always making sure to get enough vegetables in her system. Some of the foods she eats on a regular basis are oats, sweet potatoes, brown rice, chicken, peanut butter, green vegetables, salmon, flaxseed oil, and egg whites. If she’s craving something sweet, Nina will opt for raw cacao powder. She believes this is much healthier than consuming artificial sweets such as cakes and milk chocolates. Nina’s idols in fitness are Jamie Eason, Ava Cowan, and Monica Brant. These athletes had inspired Nina to start competing in fitness shows, and live a healthy lifestyle. Nina Silic had struggled with eating and body image disorders for several years of her life. They not only damaged the way looked, but also caused her to lose her self-esteem, and mental well-being. It took her many years to get through these adversities, but, when she came back – she was stronger than ever. Even though these events that happened in her life might seem like something detrimental, they ultimately helped her become much stronger, and also, healthier. This is why it’s important to look at negative events in your life as opportunities to rise above them, and grow stronger. By having this kind of attitude towards life, you too can turn your dreams into reality – just like Nina Silic. Incredible story. Takes courage to be able to speak out about things that we may not want others to know. I hope her journey can inspire and help others in a similar situation.